One of my excursions in the practice of medicine was into applied psychophysiology & biofeedback. It began in residency – I was a bearded, Birkenstock-wearing resident who declined to wear a tie with my mandatory white jacket, encouraged to pursue a biopsychosocial model in appreciating health, disease & healing, but the psychosocial seemed too often to be missing in the treatment plans adopted by my attending physicians. Native in a few of my mentors – the venerable Lou Rosin, my residency director, come out of retirement after 40 years of family practice in remotely rural Bayfield Wisconsin, and Shelly Burchmann, another refugee of retirement, an anaesthesiologist who ironically had dealt with unconscious patients most of his career, but now focussing on chronic pain and hospice, two areas where the psychosocial issues are both clearly evident & centrally important. I supplemented my experience in the hospital & outpatient clinics with readings challenging Cartesian mind-body duality, from the literature evolving over the ‘70s’’80s. I began working with progressive relaxation with some of my patients. So a story of that. I was called one day by the labor & delivery floor – the labor & delivery nurse calling asked our family practice outpatient clinic receptionist for “that odd bearded resident that does all that strange stuff.” A woman admitted in premature labor was having difficulty sleeping, what with the hospital environment & all the interventions going on (including a terbutaline drip, essentially an IV infusion of an adrenalin analog, go figure). I walked over with a cassette recorder, talked her through & recorded a progressive relaxation session, and left the tape, with a brief note of instruction for use, on the bedside table of my soundly-sleeping client. No more news of that client, until visiting back in Milwaukee 3 years later. I walked into the local drug store (Oriental Drugs) late one evening; the pharmacist spotted me, & hollered, “hey, doc Taylor!” & a fellow stepped out of an isle, said “are you doctor Will Taylor?” I nodded, he asked, “you got any more of those tapes, like you made for my wife?” Ends up it worked well for her sleep & they now had a lively 3-year-old, he’d used the tape to help with anxiety related to stress at work, they’d given it to a friend to help a daughter with an eating disorder, & it went a few more rounds with others, but was now worn out. I got his address & mailed a few new tapes, who knows how many lives they’ve affected. Anyway, back to residency. We had a clinical psychologist working with our program, Lynn Vice, a cognitive-behavioral therapist and exceptional human being. Lynn’s tasks were several; teaching us how to talk with patients, training “interviewing skills,” teaching us brief counseling strategies, anchoring the psychosocial aspects of our biopsychosocial model of family practice training; and very importantly helping us learn how to care for ourselves as physicians, a well as discern our individual paths in the profession. I worked with Lynn to refine my skills at teaching clients relaxation strategies, and one day – before my northwoods loon encounter – she sat me down & told me I needed to practice these myself, to fully appreciate and be truly effective with them. Also so I wouldn’t die during residency. Lynn had some biofeedback equipment – a couple of old J&J modules – that she loaned me to experiment with, & my mars- & mercury-governed gadgety mind had a blast with them. Measuring & providing real-time feedback of finger temperature (peripheral vascular tone) with a thermistor, & skin conductance; a function of moisture in the skin, hence of autonomic regulation of the skin’s sweat glands. I began attending workshops, the annual convention of the Association for Applied Psychophysiology & Biofeedback, and met some mentors & colleagues – notably Jeffrey Cram, Stephen Stern. My main focus, in line with interests developing over the same time period in chronic pain management, was in surface EMG (muscle activity) monitoring & biofeedback, particularly in use; using dynamic surface EMG recording during movement to document & provide feedback re muscle activity & balance, to document & augment the work of Vladimir Janda on myofascial dysfunction, overlapping with my studies with Janet Travel in myofascial pain. I had the privilege of contributing to the early development of this field of work, collaborating with my good friend Jeffrey Cram, who lived at the Ananda spiritual community near Nevada City California, using surface EMG recording in the early detection, prevention, and treatment of occupational “repetitive use” syndromes. During the mid-1980s I was the primary teacher of surface EMG biofeedback for the Stens corporation, a biofeedback equipment distributer, training & support organization for practitioners, headed by Stephen Sterns. In addition to this more mechanical use of EMG biofeedback, I was intrigued by psychophysiologic applications in training autonomic balance and general relaxation. Eric Peper, then of San Francisco State University, was a close colleague working with respiratory biofeedback in the management of asthma, chronic obstructive pulmonary disease, panic & anxiety disorders, and general physchophysiologic health. One of the rare functions of the body that falls under both autonomic & direct voluntary control, respiration (actually ventilation, the activities of the body governing the movement of air into / out of the lungs) seemed to underlie one’s ability to control such diverse measurable psychophysiologic variables as peripheral temperature (peripheral vascular tone), pulse volume & rate, skin conductance, & resting tone of the principal muscles of emotional expression, variables we could easily measure & provide as direct feedback to the patient in psychophysiologic training. In providing biofeedback of these variables to patients in training, it was most often the rate & pattern of breathing that we were employing to gain regulation. Biofeedback of breathing pattern itself was awkward in the day. In addition to the most expensive instrument available, the patient’s hands, one on belly & one on chest, I employed a device with two lengths of surgical tubing, one encircling the chest, the other the belly; each containing a powdered resistance material, such that electrical resistance varied with stretch of the tubes; this could then be displayed on a light bar initially, & later on a computer screen as computer integration of our equipment was developed, displaying the rate & rhythm of ventilatory efforts, and the relative contributions of diaphragmatic and thoracic breathing. Eric dabbled with the incentive inspirometers used in hospital following surgery, to provide feedback on the actual volume of air moved in respiratory effort, to train slow deep breathing. It was often easier though to provide feedback of some resulting physiologic variable, such as finger temperature, using a thermistor taped to the finger, or pulse rate & volume, using a photoplethismographic sensor clipped to a finger or earlobe, all reflecting peripheral vascular tone; or skin conductance, reflecting autonomic regulation of the skin’s sweat glands, passing a tiny current between electrodes affixed to two fingers; or surface EMG recording the electrical activity of muscles of importance in emotional expression, such as the occipitofrontalis, with recording electrodes on the forehead; the masseters, recording jaw tension; or the upper portions of the trapezei between neck & shoulders, bearing the weight of the world on the shoulders. All of these reflecting balance between “fight or flight” sympathetic and “rest & digest” parasympathetic nervous activity, and most easily modified by the individual by attending to respiratory rate, depth, & pattern. Heart rate variability stepped forward as another measurable reflection of autonomic balance in the early ‘90s. With computerized processing of harvested psychophysiologic information, it became possible to easily monitor the beat-to-beat variability of heart rate, measured with a photoplethysmographic sensor clipped to a finger or earlobe. Heart rate is initiated intrinsically in the myocytes of the sinoatrial node and is influenced by a complex variety of factors, but rests in a delicate balance between the stimulatory effects of the sympathetic nervous system, mediated by sympathetic innervation and circulating catecholamines; and the calming effects of the parasympathetic nervous system, mediated by the vagal (tenth cranial) nerve. In normal functioning, this results in a rhythmic variability of beat-to-beat heart rate, reflected in the easily monitored peripheral pulse. The degree of variability, and more significantly the regular rhythmic nature of the variability of heart rate, provide a reflection of the degree of autonomic balance, the balance between the stimulating, alerting, “fight or flight” activities of the sympathetic nervous system, and the “rest & digest” activities of parasympathetic activity, both vital, but vital in balance, to the normal healthy functioning of the organism. With the advent of relatively inexpensive handheld devices for signal processing and display, sensors & software have become available to permit heart-rate variability biofeedback not only on desktop & laptop computers, but on smartphones & tablet devices as well. I’ve been using the HeartMath sensors & software on my Macintosh computers for several years, and more recently on my iPhone & iPad (currently this is available for OS X, Windows, iOS and Android devices). I’ve employed biofeedback in my medical practice professionally for over 30 years, and utilized it for personal health casually over that time, but never imagined I’d be requiring it as an essential aspect of health management personally. My stroke knocked out the right basal ganglia of my brain, an area controlling, among other things, extrapyramidal motor neurons involved in the inhibition of primitive spinal reflexes, including those reflexes that permitted our arboreal ancestors to cling to the branches of trees; so for my left arm, resulting in uninhibited spasms in clench/grasp of the hand, flexion at the elbow, and internal rotation / abduction at the shoulder. 2 years following the “event,” following an extended period of DIY attempts at therapy (my initial therapies focussing on walking were marvelous; but the clinic I worked with initially divided me at the waist between Physical therapy (lower extremities) and occupational therapy (upper limbs), I finally located a gifted physical therapist (Ruth Holloran, DPT, at Progressive Rehabilitation Associates in Portland OR) who recognized this for what it is, who had the training & skills to begin to address it. While designing an exercise program for me, she noted that these were the exercises demonstrated by EMG studies to be effective in restoring functional muscle balance in the shoulder; guess who had performed those studies? I also was struggling with autonomic arousal, with frequent episodes of psychophysiologic tension, manifesting as increased heart rate, elevated blood pressure, cognitive confusion or “brain fog,” and feelings of tension throughout my body quite unfamiliar to me, and unresponsive to the strategies I had learned over time. I’ve practiced zazen – sitting samatha meditation – for over 40 years, and (unwisely) fallen away from regular daily practice, as its integration into daily life seemed automatic. Now samatha practice is something quite other than, but is still in part dependent on, the calming of psychophysiologic arousal of the body, but through this practice, I’d become rather adept at maintaining a healthy autonomic balance. Sadly the damaged region of my brain, the right basal ganglia, involve the central operations of the autonomic nervous system. That skill was gone, as was my left hand’s memory of this keyboard, in the death of a small but important portion of my brain. Fortunately the functions of the brain are not “hard-wired” into particular regions, but following damage may be taken up by functioning neuronal networks exercised to take over. The trick is in training new neural networks to adopt the “lost” functions. I don’t wish to use this platform to advocate for individual “products,” but do wish to speak of Truly Useful Gadgets when that seems appropriate. In order to exercise functional breathing patterns to restore autonomic balance, I’ve played with a few novel biofeedback devices. Utilizing an iPhone’s built-in motion sensors, the iOS APPs BioBelly and Lull (along with a few similar) work with a phone tucked into one’s waistband or lain on the belly when supine, and provide auditory feedback of abdominal breathing rate & rhythm based on abdominal respiratory excursions; visual feedback in real time is not available due to the phone’s location in one’s waistband. Going this several better, Spire provides a small independent sensor/feedback unit that clips into one’s waistband, that pairs with an iOS or Android device via bluetooth, with an APP for processing & display of breathing rate, rhythm, and algorithm-processed interpretive data; real-time feedback is provided by visual display of the respiratory rhythm, and a simple game-like interface, with a library of included recorded scripts or “boosts” walking one through guided practices. 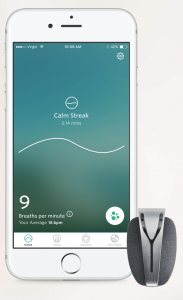 The device also serves to log breathing patterns, and categorizes these as “streaks” of calm (slow, regular), focussed (more rapid, regular), and tense (rapid, irregular) breathing; also logging activity, steps taken, and estimated caloric expenditure in activity; the device also provides notifications, both via text notifications on the paired device and vibration of the sensor on one’s belly, for feedback proximate to stretches (“streaks” of calm, relaxed, & tense breathing, reminding one of one’s breathing status as it’s worn throughout the day. My unit is relatively new to me, but my experience in using it these past few weeks, is that it serves as an excellent device for respiratory pattern biofeedback, both for discrete practice sessions, and while engaged in activities about the day, in order to generalize one’s self-regulation into daily life, as well as a device for logging and retrospectively examining one’s breathing patterns, and hence autonomic balance, over the course of daily activity. The ability to achieve calm functional respiration has returned easily for me, with only a little practice; its generalization into the normal activities of daily life has proven more difficult, and this is really where the Spire device & APP have come into full usefulness. The device on and APP open now on my phone, displaying my respiratory rhythm as I type this, I’m able to observe & maintain a smooth regular rhythm of 12 breaths per minute (a “focus streak”); with real-time visual feedback, and with alerts to my phone when I veer from this pattern; not the “calm” 6-8 breaths per minute I can easily achieve in a focussed relaxation session, but far better that the highly irregular 17-20 breaths per minute I tend to fall into when inattentive. The goal, of course, of biofeedback is to become independent of the device, of external feedback, to utilize the provided external feedback to develop & cultivate internal cues of awareness. The logging function has also proven useful. Including synchronization with my phone’s calendar, photos, health kit and location awareness, I can retrospectively identify those situations that prove most challenging as well as most conducive to autonomic balance, offering the opportunity to modify those activities as they recur, or build in self-management pacing or other strategies. Overall, an elegant (pleasingly ingenious and simple) instrument, built for an ingenious & complex organism. This entry was posted in tools for dealing with brain injury. Bookmark the permalink.